That all people are reunited with their Hispanic relatives. To make a positive, lasting impact on the lives of families. Find Relatives In Mexico (FRIM) believes all families should be connected. When relatives live in Mexico, we believe in providing essential services to those who have given up and lost hope. By identifying and locating their relatives, we become the catalyst to change the lives of families around the world. 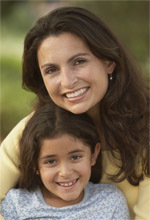 Find Relatives In Mexico specializes in finding parents, grandparents and other adult relatives living in Mexico. Too often, family members as well as genealogists struggle to know how to find a relative in Mexico. In other cases, people are using inaccurate information that can prevent them from ever finding that special person. We have helped reunite more than 6,500 families with their Mexican relatives. We have reunited people from Ireland, Australia, Germany and many other countries around the world. You may be thinking that it's so easy to find someone in the U.S. and you would be right. 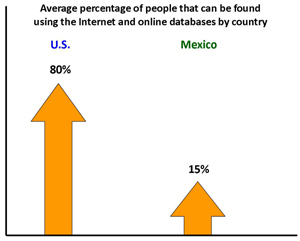 However, the truth is that nearly 85% of personal information on Mexican residents is not available online. Much of the available data is limited to secondary information, such as birth and marriage records, and not current listings with names, addresses and phone numbers. When you don't have access to this information, often your relatives cannot be found. Richard Villasana, Founder of Find Relatives In Mexico, is the leading expert and international authority on finding relatives in Mexico. "Years ago (pre-Internet) when I was working in Mexico, I learned I had a real talent for finding key government officials for U.S. and foreign clients. Then some associates started to ask me to find a relative. It was so exciting when I found someone's missing brother or birth father. The emails of thanks made my week." "Then after months of telling people that I didn't find people in Mexico as a profession, I thought, 'Hey! Maybe I can help a LOT of people who are desperate to reunite with their families in Mexico.' That was the start of Find Relatives In Mexico twenty years ago." "The most important part of all of this are the heart-warming (and heart-wrenching) cases and the messages from sons and daughters, fathers and mothers, cousins and friends who so desperately want to find a person in Mexico. And if you've ever thought teenagers can't write with emotion, just reading one of the cries for help we get would melt your heart. Reconnecting a son or daughter with their parent is incredible." Richard has been interviewed by EFE, the world's largest Spanish media company, and profiled in the San Diego Business Journal, newspapers in the U.S., Mexico, and Spain and online on MSN Latino and Yahoo! en Español about his expertise in locating family members in Mexico. He has spent 20 years living and working in Mexico. He was a university professor at UABC, Tijuana, B.C. and has given presentations at some of Mexico’s largest institutions including IMSS (Seguro Social), SSA and ISSSTE. "My biggest vice is Dr. Pepper. I can be talked into a lot of things with offers of a great hamburger pizza. I love traveling and a good hike. And it's not uncommon for me to be working at 3:00am especially if it's something that will help foster children." Read about teenage daughter reunited with her father... more. Discover five critical keys pieces of information you want to have to find your relatives in Mexico. or give away your personal information. start your Mexico genealogy or Mexico family history.